Mayapple Books announces the publication of The Paradise Tree: A Novel by Elena Maria Vidal. The Paradise Tree grows from the maxim “in every Eden, there dwells a serpent . . . .” The year is 1886 in Leeds County, Ontario. The O’Connor clan is gathering to mourn the loss of its patriarch Daniel O’Connor, an Irish immigrant. The story of Daniel and his wife Brigit is one of great hardships, including illness, ill-starred romances, war and political upheavals, as well as undying love and persevering faith. As Daniel is laid to rest, his grandson Fergus receives a piercing insight into what his own calling in life will be. The novel includes adult themes of struggles with addiction and depression, as well as the ordinary trials of parenthood and married life. The author took care to insure historical authenticity in portraying the way of life of early settlers in Ontario. Illustrations, an index, and a bibliography are included. Now available internationally from Amazon.com. O high and glorious King, O Light and Brightness true! Make my comrade welcome, and grant him all your aid. 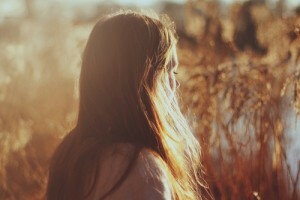 and soon will come the dawn. “Elena Maria Vidal, author of Trianon, Madame Royale and, most recently, The Night’s Dark Shade, has a gift for writing beautifully while transporting one into past times and places and keeping one’s attention riveted as if there oneself. In the 13th century, Catharism–”The Great Heresy”–had swept through Languedoc, France and gained a stronghold, its adherents of noble and common stock alike. The problem was so serious the Catholic Church had instituted a crusade against the heretics, who had drawn numbers of the faithful away by their esoteric teachings. Louis VIII, crowned in 1223, would lead the crusade, reclaiming Aquitaine and much of the southern territories and leaving to his heir, St. Louis IX, a Capetian reign that extended from England to the Mediterranean. In the midst of this medieval landscape, enter the maiden Raphaëlle de Miramande, vicomtesse, protagonist of The Night’s Dark Shade, who, bereft of her father as well as her betrothed, both killed fighting alongside King Louis “the Lion” in the crusade, fears an unclear future. The Knights Hospitaller of St. John, that august military order whose members numbered the fiercest warriors against the Saracens, play a prominent part in this novel. Without giving away two much, two knights in particular represent opposite poles in young Raphaëlle’s moral life–on the one hand, duty, obligation, and fidelity, and on the other, passion and temptation…. “Historical fiction is a fascinating genre because when done well it reveals truths about both the past and the present. It allows us to experience both what was unique to the era of its setting while recognizing what is universal in our humanity. 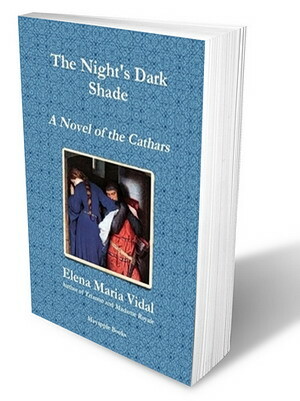 The Night’s Dark Shade: A Novel of the Cathars represents historical fiction done well, particularly when revealing the dangers of the Cathar movement in the 13th century and holding up a mirror to the 21st. By telling the story of Raphaelle de Miramande’s encounter with a castle occupied by Cathars, especially with the Perfecta who may become the young heiress’ mother-in-law, Elena Maria Vidal bravely dramatizes the consequences of Cathar teaching. I say bravely because the Cathars or Albigensians are very often depicted as heroes for their opposition to the Catholic Church or as victims for their suffering in the Albigensian crusades against them in southern France—perhaps because their admirers sympathize with their sexual ethics and their Gnostic elitism…. The Night’s Dark Shade can be purchased from Lulu.com, and Amazon.com.